In stock 44 items in stock. 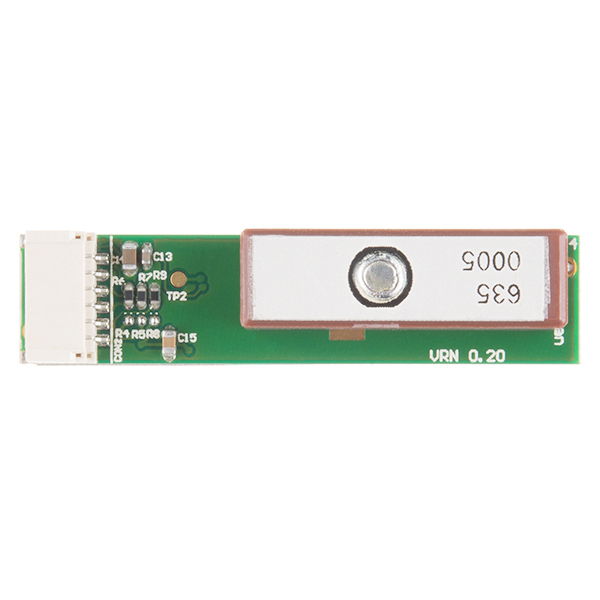 The GP-735 is a slim, ultra-high performance, easy to use GPS smart antenna receiver. 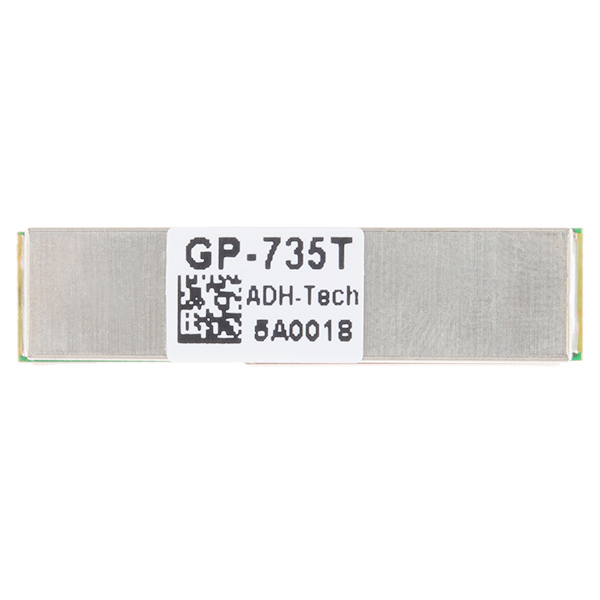 With -162dBm tracking sensitivity and only 29 second cold start time, the GP735 is a tiny, yet powerful, piece of tech. The slim design makes it ideal for applications where you don't have a lot of space to work in. Really it's quite small. 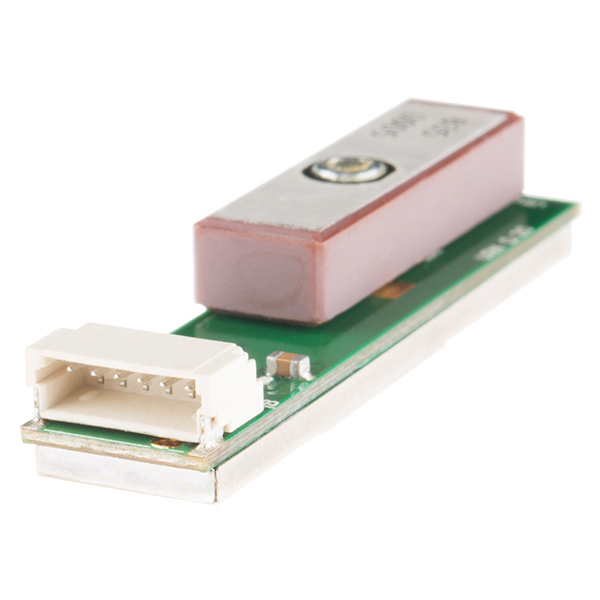 This 56-channel GPS module, based on the uBlox 7th generation chipset, has an operating voltage of 3.3~5.5V, an antenna on board, and connects to your system via TTL serial. The 1Hz update rate is fast enough for the majority of applications (and can be increased to 10Hz if you need) so whether you're tracking a pet or building an autonomous car, the GP-735 has you covered! 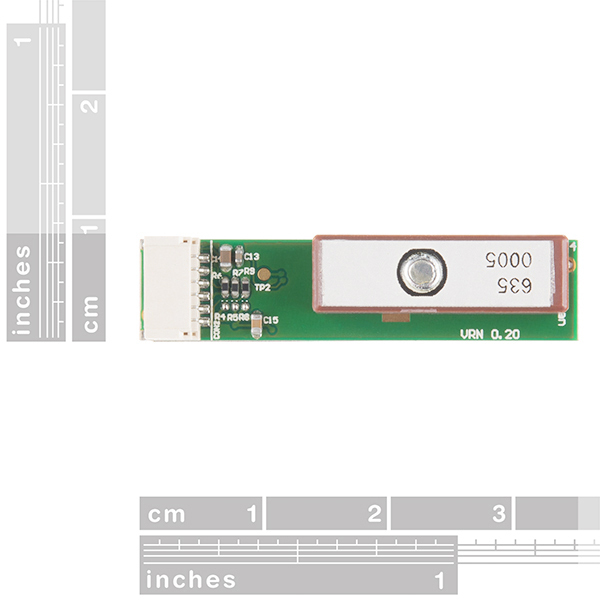 **Note: **We are carrying the "T" option of this module which is TTL-UART and not USB. Note: This receiver works with 6-pin 1mm pitch JST type cables and connectors which you can find in the Recommended Products section below! Read humidity, pressure and luminosity quickly and easily. Add wind speed, direction and rain gauge for full weather station capabilities. So what commands are necessary to set it to 10hz ? And, does that setting stick after losing power or does it have to be set every time it's powered on? 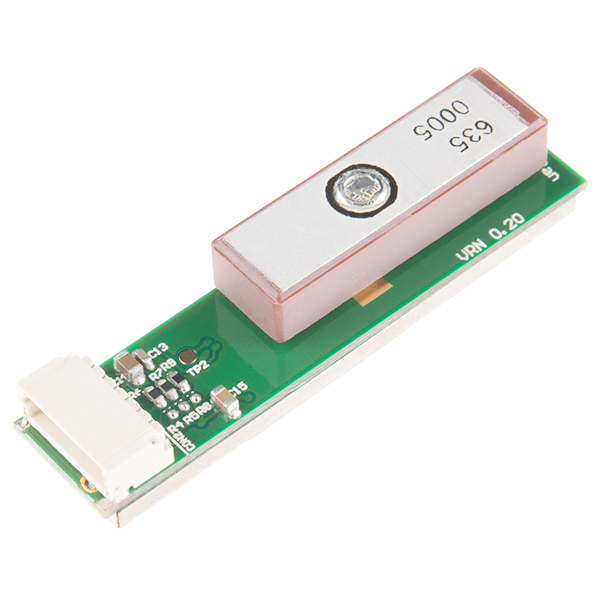 The GPS module works great when it's connected to my desktop PC but when I power it from a 2500mA battery it takes several minutes to lock and drops out regularly. The module is connected to a Mini GPS Shield and Pro-Mini and powered from a FTDI card in both cases. Does anyone have any tips for using it on battery power? every time i turn down the module by the power control pin, it looses all of the data, when i turn it on i have to wait about 40 seconds, i have battery backup, connected. Any suggestion on how can i make this device go to low power consumption, with out loosing satellite data? Is this a direct plug-in replacement for the 635T to use in the sparkfun weather shield? I contacted the manufacturer, and they said the u-blox module is a G7020-KT. I wasn't able to update the firmware on it, but I was able to use the u-blox management software (u-center) to view information coming out of the receiver, and to do some simple configuration such as change the baud rate. Regarding the availability of a PPS output, I am afraid the story there is rather grim. There is obviously no PPS output on the 6-pin connector, as is evident from reading the datasheet. I also looked carefully at he visible traces and connection points on the module, and there's nothing there but the signals on the connector. I am sure the u-blox module inside this thing does have a PPS pin, but you'd have to crack it open to get to that, and it's very likely you would break it. You could use the first start bit (falling edge) on each burst of serial data as a crude PPS output, but i am looking at that on my scope right now, compared to a true PPS output from another module, and there is about 58 - 66ms of delay from the true PPS output to the start of the serial transmission. The delay is not a big deal, but that 8ms of jitter will be an issue for many applications. So I would say this is a good module for location sensing, but not suitable at all for any sort of precision time application. Really, it's ashame because the PPS output could have easily been plumbed out and accessible with zero additional cost. SparkFun, maybe you can encourage the manufacturer to do that in a future iteration. Despite getting a new u-blox datasheet from the manufacturer (as I reported below), I to have been unable to change the settings on the module. I'm getting good NMEA data from the module at 9600,8,1,N, but cannot change the parameters laid out in the new sheet. I'm just using a PIC and debugging from that. I really want to turn off all commands and poll the ones I want when need be. According to the datasheet this is easy, but I send the command, wait for the reply, I get nothing in response (except endless NMEA). Fired off another email to my contact in Taiwan today, and am hoping for the best. You used u-center, is there any source code for that, just seeing how they changed the baud rate would be a start. Well, finally got parameters to change. I used a terminal emulator, (back to the microcontroller tomorrow !). 1) The Update Rate, so I can go from 1Hz to 10Hz. 3) I can Enable and Disable the NMEA Sentences. 4) I can Save Configuration to Battery Back-Up RAM. 5) I can get the Hardware and Software Version. There are a number of other commands I might try playing with once I fully understand these, and I get my microcontroller to do the work ! Have you managed to get the uC to talk to the GPS? How did you end up getting the unit to respond? Sorry, haven't been here in a while. As I mentioned in other places I got a datasheet from Taiwan, I first of all programmed my uC to send the BINARY eight bit codes that they define and watched what came back with the terminal emulator. Once I saw that that data looked good I used a interrupt UART port and just captured the data as it came in. Then I sorted through that data looking for the response I was looking for. Apparently no one can see me email address on my Account Page, so I'll just post it here...purchase55@aol.com. If you don't have a datasheet, or you want some 'C' coding tips, I'll send you some. The device has (according to the datasheet) an RS232 Rx pin, suggesting it can receive data from the microcontroller. The datasheet also says âUpdate rate: 1 Hz (default), up to 10 Hz by enabling commandâ suggesting commands can be sent to the module. Has anyone tried to send anything ? Iâm getting swamped by NMEA data that I donât really need, and Iâd love to switch off some of the NMEA replies (as you can with other devices), but I just canât find any documentation anywhere. I've just got a datasheet from the manufacturer. You can do a heck of a lot with this this module that is not documented ! I have yet to test it, and the check summing of the strings you send it is really weird, but I'll try out a few commands in the next few days and see how it goes. I'm very wary about changing the baud rate in case I can't get it back to 9600, so I'll start with some other commands. Members of this board should be able to access my email address if you want a copy of the PDF file. Your junk email no longer seems to be working. Got another address ? Email it to me if you want. What specific u-blox module is this using? I've spent the last 2 hours trying to determine this information from the u-center software, but I can't find a way to do that. It's also not listed in the "datasheet" linked above. It is 9600. However, you can download the u-center software linked above and change the baud rate to whatever you want. Does this have pin out for 1PPS pulse ? datasheet does not mention except in specs ??? I don't see in the datasheet any mention of PPS (a text search in AdobeReader for "PPS" shows zero hits). You might be confusing PPS with update rate. Unless one of the test points accessible on the top-side is the PPS signal, I think the only way to get a PPS out of this is to kludge a pseudo PPS by setting a PPS flag at the start of each second's worth of NMEA sentences and then clearing it 500ms later. I think <4g is the acceptable acceleration limit(<4x gravity), not the mass. Does anyone have the weight of this module? Could be a good contender for small flying stuff if it's light. On retrospect, I think you are right that I misread the <4g acceleration limit as the item's mass. My bad. 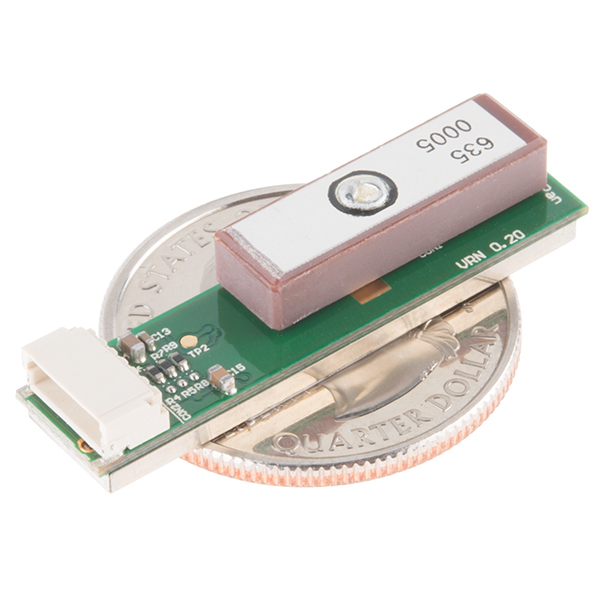 This little tiny (and light) GPS module would probably work well for amateur high-altitude ballooning. The stated max altitude is 50km (164kft). When I was working at UDel, one of the projects I worked on was stratospheric balloons (we had 2 payloads, and collaborated on a 3rd). These professionally made zero-pressure balloons typically topped out at between 120kft and 130kft (under 40km). Many amateur launches using rubber weather balloons should expect between 60 and 105kft (18.3 to 32km), well within the max altitude of this module. At a weight (well, actually mass) of less than 4 grams, that leaves more payload capacity for other things, or to allow more altitude. The GPS itself is good - the module, not so much. Unusual cable adapter and they don't include the cable! Also, in a fit of unrelated frustration I switched the polarity (I know, I know) and instantly fried the device. So obviously there is zero protection built in. We built a small beacon for our high altitude balloon flights using this unit, a PIC chip, and an XBee. The system works great below about 40,000 feet. I specifically purchased this unit because the datasheet says it works to 50,000m. Seems that it might be able to do that, but you have to reprogram the GP-735. The problem is that there is almost zero information about how to do that. We have tracked down a possible solution that we will try. If you are not going to high altitude, then this is a great product. By the way, it will run on much lower voltage than they claim. We have been able to drain our batteries all the way down to 2.5V and still get good performance. Fast & Easy to get going! This was my first time playing with a GPS on a Raspberry Pi and the GP-735 made it very simple. Just connect power and a serial port (it runs on 3.3v so just direct connect it to the RPi directly) and you'll immediately start receiving NMEA "sentences". (A simple "cat /dev/tty0" or similar for your setup will output it to your display). I was in my "maker space" about 4' from a basement window and this still managed to lock on to the GPS satellites so it seems pretty robust even with a built-in antenna. It's very small and can really fit anywhere. It does not come with the cable that plugs into the end so be sure to order that separately...I ordered two just in case. Tiny, but very powerful receiver using the latest uBlox chip. Using it with an Arduino Uno R3, and NeoGPS, so I can parse out both GPS and Glonass satellites. System works very well. Yet to test its functionality but I realized this does NOT come with the JST SH Jumper 6 Wire - 1.75" cable which retail for another $2.95. I did not read carefully and simply expected a $40 dollar GPS module would come with the GPS or the weather shield. I can't ask for free cables but why not just put it in the package and adjust the price accordingly? The receiver works great when connected to my PC via the mini-shield/Pro-Mini and a FTDI board. Connects and locks on 6+ satellites within 30 - 40 seconds, even indoors!. But (why is there always a 'but'?) on battery power, outdoors, it takes 2 minutes or more to lock and drops out regularly. The battery is a 2500mA, 5V lithium cell phone charger plugged into the FTDI USB port. Does anyone know what tricks are requires for battery operation? Easy to use works as expected. Only complaint is that the chart in the data sheet listing the pin out numbers the pins opposite the standard pin numbering on the JST-SH connector. Other than that the compact size is great, easy to use no complaints. Started the prototype using an Arduino Mega along with softwareserial and tinygps++ libraries and it worked great. Eventually ported it over to the esp8266 IoT platform running Blynk and I never had a problem with it. I will say that you shouldn't rely on GPS (any type) altitude as it was sort of in the ballpark, but changed very frequently presumably due to the acquisition (or loss) of additional satellites. I did not have any trouble receiving over 5 satellites indoors which was very convenient. This receiver presents a great value. It's lower cost that most others yet it works just as well as other units. It's in a tiny format so it easily fits into small enclosures, quickly picks up satellites and maintains those signals when its moved around. I used a jst cable and breakout board to connect it to my Arduino project. The TinyGPS library made accessing the data in a usable format a snap. I got this one because I needed a GPS slimmer than the standard one with a 1"x1" ceramic antenna. There are 2 issues: the claim is 20-30 seconds cold start. Maybe under perfect conditions, but definitely not sitting right next to a window. And doesn't work 5 feet from the window inside a standard house. Another GPS module (ubox) had no problem even with a cold start in the same spot. Also while working with a battery at 4 volts, stopped working when the battery discharged to 3.6 V.
But has a couple of imitations the larger ones don't have. It takes about 30 seconds for the lock to occur after power up. Once locked, the module can be put into power-down mode and come back up very quickly. Maybe it remembers its previous position and can re-lock quicker? I could not write to the module at all. I don't think that feature is supported. I used it as a real time clock with a PIC micro to control my landscape lighting and it worked well in that application compensating for DST, etc. Small, and simple to use! I bought this to use as a simple GPS receiver for an Arduino project. It works great for that. Just remember to buy the recommended cable. Also pay attention to the pinout diagram in the data sheet. The black wire on the JST cable is NOT pin 1, it is pin 6. That took me a while to figure out, but once I read the manual this started feeding data to the Arduino without issue. It is not the fastest GPS module I have used, taking a while to get a fix and only 1hz updates, but the signal is solid and even sitting at the window indoors, it is getting 7 sats. Ordered the cable and the unit. Used my MB500 to power it up and capture and decode the serial output. Copied the lat/long values, converted them to fractional degrees, and entered them into Google maps. Once it found enough satellites and switched to mode 2 it was accurate within a meter or two - dropped the marker right on top of me. Very nice unit.